In this project, you will learn how to make a pop-up card with a simple balloon pop-up inside. 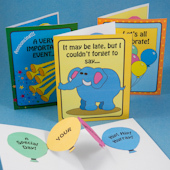 The cards offered in this project are birthday cards, party invitations and blanks for any occasion. The balloon pop-up is made like a paper doll chain. 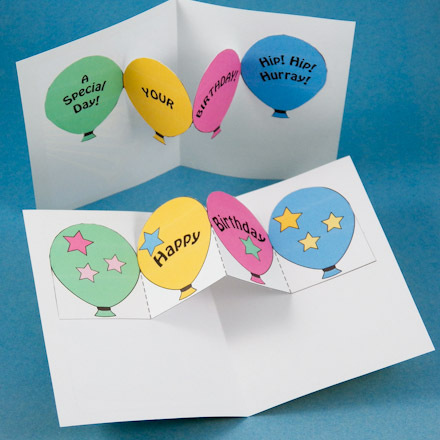 Using that idea, you'll cut a chain of balloons and glue it inside the card to make a pop-up that springs out when the card is opened! 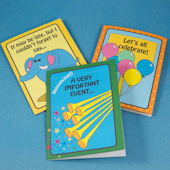 The project includes printable patterns for birthday cards in two different designs featuring trumpets and elephants. A set of party invitation patterns, in color and black & white, is also included. 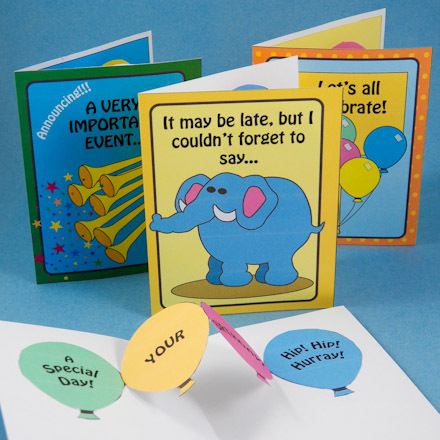 Related crafts: See the Pop-up Birthday Cards tutorial for another pop-up idea and the Valentine with Pop-Up craft project for a chain of hearts pop-up. Checkout Envelopes to Make and use the Pop-up Card envelope pattern for the cards in this project. Choose the pop-up card you want to make. Download and print the pattern. Each card pattern has three pieces: the card and two balloon pop-ups. Print the card pattern on cardstock and the optional "Card Insides" pattern on paper. You can also make the card from paper by printing both the card pattern and the "Card Insides" pattern on paper. 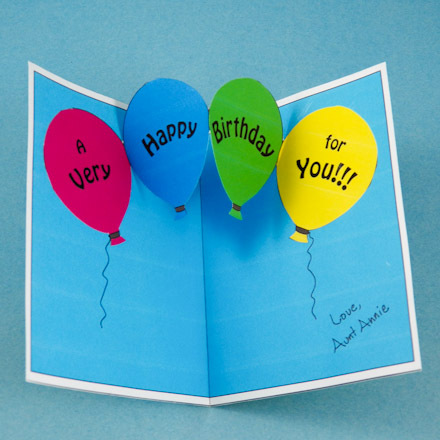 If you printed a black & white or blank pattern, use colored pencils or markers to decorate the card, card "insides" and balloon chain pop-up. Cut out each pattern piece on the solid black line. Try to make your cuts very straight. The card will look better and fit together more easily with straight edges. Tip: The card "insides" piece is optional when making the card from cardstock, but it does add a finished look to your card. Fold the card in half on the center line with the design on the outside. For the "insides" piece, fold the colored side inside the fold. If you are using cardstock, score the fold lines first. If you are using the card "insides," glue this piece inside the folded card. Put glue on one half of the "insides" piece. Slide it inside the card. Press. Turn the card over, and put glue on the other half of the "insides" piece. Press again. The pop-up is a chain of balloons. There are two pop-up strips to choose from. Select one and save the other to use inside another card. The pop-up must be folded before cutting out the balloons. Fold the pop-up like an accordion. First, fold the pop-up piece in half on the center line. The marked side is on the inside. This is called a VALLEY fold. Second, fold back each of the end balloons on the lines. These folds are called MOUNTAIN folds. Hold the folded stack of balloons together and cut carefully around the balloon shape. Do not cut any of the folds. Unfold the pop-up and you have a chain of balloons. You can decorate the balloons anyway you like. You might add some stars or use glitter. Tip: For easier cutting of the pop-up, just cut the tops of the balloons or even leave the strip uncut. Fold the balloon chain the opposite way—VALLEY, MOUNTAIN, VALLEY. The colored sides of the balloons are all on the inside. Leave the balloons in this folded stack for gluing. Open the card flat with the inside of the card up. Put glue on the back of the last balloon in the stack. Glue it about ½" from the right edge of the card. Be sure the MOUNTAIN fold is on the right. Next, put glue on the the back of the balloon on the top of the stack. Fold the left side of the card over on top of the pop-up and press. Tip: The birthday pop-up card patterns come in two designs. 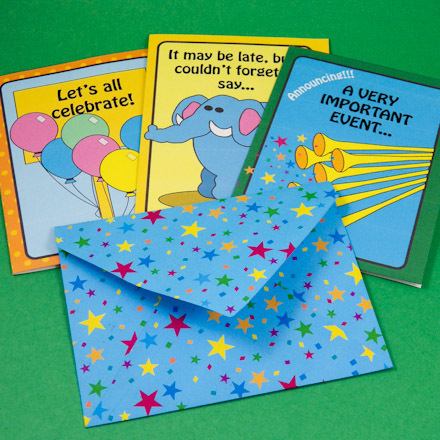 The third design is a party invitation pop-up card. 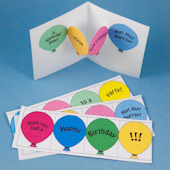 Tip: For an easier to make pop-up, only cut the top of the balloons, or simply fold the strip and glue it in the card without cutting the balloons out! Tip: Boost the balloon chain's pop-up effect by gluing the balloon stack at a slight angle. Tip: Download and print the Stars and Confetti ePaper digital paper to make envelopes for the pop-up cards in this project, or to create coordinating French Door Sticker Gift Tags with Birthday Stickers. 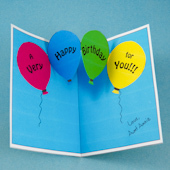 Tip: Save the extra pop-up strips to use inside any birthday card or invitation!